Ultimate Stoke FC - The Best Online Stoke City Fanzine Site: Michael Uchebo - One For The Future Or The New Demba Ba?! Michael Uchebo - One For The Future Or The New Demba Ba?! So it was confirmed yesterday that Michael Uchebo, the 6ft 8.5 inch Nigerian born striker was finally at the Potteries for a trial and chat with mananger Tony Pulis. Uchebo is out of contract at the end of the season with his current club VVV Venlo, a team that play in the dutch Eredivisie. Have we heard of VVV Venlo before? Well in 2010 they did sign a 1 year old baby, Baerk Van Der Meij for a scoring a hat trick in that youtube video that went viral worldwide ( http://www.youtube.com/watch?v=31pxEs64z9s) for that he was rewarded a ten year contract! So we wanted to find out more about Michael Uchebo, the man dubbed the new Peter Crouch, although his goal scoring record is nothing to write home about, 37 played, 5 scored. So tell me about VVV Venlo are they are successful dutch club? VVV-Venlo is club wich was founded in 1903. It is a club which is located in Venlo, in the south-east of Holland. Venlo is a small city of about 100,000 inhabitants. VVV-Venlo play at Seacon stadion -de Koel- with a capacity of about 8,000 spectators. VVV is playing at the highest level now for the third season in a row. The were promoted to the "eredivisie" (Dutch Premier League) after their second championship (1993 and 2009) in the dutch first division. The years before have been both successfull and less success full as well. Before 2006-2007 they played in the first division for 13 years and finished in last place once. First division in Holland has no relegation those days so they stayed up. VVV have had some successful years. They won the cup in 1959 and had several chances to qualify for the Uefa cup. But they never succeeded. They also won some legendary matches against Ajax and Feyenoord (search at youtube for "VVV-Ajax sneeuw". a legendary match on a pitch loaded with snow and a 3-0 victory). Now up at the highest level since 2009 but still a modest club and they trying to grow. They are planning to build a new stadium for about 17,500 spectators wich should be ready by the start of season 2014-2015. Till then expectations are not to big. Try to stay up. It doesn't matter how, just stay up! The best way at this moment is to buy cheap (foreign) talents and give them a chanche to play in the eredivisie. One example is Keisuke Honda, a Japanese star, who started his European career in Venlo. An other name is Ahmed Muse, recently sold to CSKA Moscow (like Honda). What are the fans general thoughts on Michael Uchebo? We hope to sell Michael asap! His contract ends at the end of this season, so this is the only possible way to earn a bit of money on this guy. What are Uchebo's best skills and qualities? He's strong and can make beautiful moves in small spaces. Sometimes he's very clumsy (I guess because of his long legs) but sometimes it looks very clumsy and then he manages to get out of the situation in a beautiful way. He needs assists to score goals. I think he needs to be a bit more patient and he needs a bit of good luck to get into really good form. And, of course, teammates who make him a better player! Will his departure be a big loss for VVV Venlo? No, I don't think so. Because of the money aspect. £1 million is a huge amount of money for modest club VVV and they will be able to get new players for less money (and hopefully sell them in future). VVV does also have another Nigerian striker, Uche Nwofor, who is even a bigger talent. We hope he will get his chance! Do you think Uchebo has the ability or the promise to make it at the highest level in the Premier League? That is very difficult to say. At first I would say "no". But we've only see him play with these teammates. Stoke is a diffent team, with different players who will probably make Michael a better player. So he might make it at this level. He is also a young player. He is not very experienced so give him a chance. 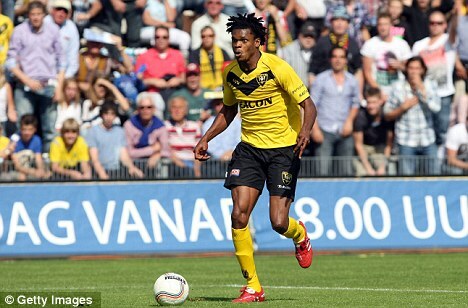 What will VVV Venlo do with the transfer fee, are they a selling club or would they reinvest for new players? Like I said before: Reinvest in new players. First goal is to reinvest in players so that we stay up, second goal is to invest in players and make a profit out of that. Finally what are Venlo fans' thought on Stoke City Football Club? Do they get much coverage over in the Netherlands? In the south east of Holland I think there aren't a lot of people who really know Stoke (including myself). Off course they know Stoke because of the possible transfer of Michael Uchebo but I doubt if they know Stoke plays European football in the Uefa league. There is some coverage of the Uefa league on pay tv with not to many viewers so Stoke doesn't get much airtime. However, it is increasing since they reached the Uefa league!